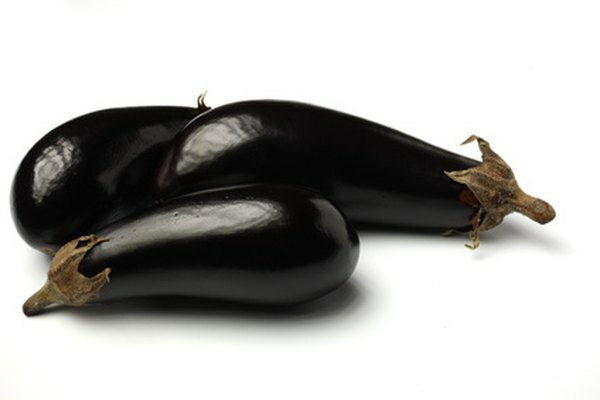 Eggplant, or aubergine, is nutritious and diet-friendly; 1 cup of eggplant contains just 38 calories. Although especially popular in Asian, Mediterranean and Middle Eastern cuisine, this vegetable works in a wide variety of dishes. Try it baked, grilled, fried or boiled, with or without soup stock or tomato juice, to discover which taste you prefer. You can also stuff eggplants with meat, cheese or vegetables. Eggplants are an excellent source of soluble fiber. In addition to keeping the intestine healthy, fiber helps reduce blood cholesterol levels. This, in turn, may help protect your cardiovascular system from the damaging effects of high cholesterol. A 100 gram, or 3.5 ounce, serving of boiled eggplant has 2.5 grams of fiber, according to the U.S. Department of Agriculture's Nutrient Data Laboratory. This means 1 cup of eggplant provides around 10 percent of your daily fiber requirement. Among the nutrients abundant in eggplant are potassium, iron, zinc and B-complex vitamins. A 100 gram serving of boiled eggplant contains 123 milligrams potassium, a mineral that keeps the heart and other muscles functioning normally. Eggplant also supplies vitamins B1, or thiamine, B6, or pyridoxine and B3 or niacin and folate. B vitamins help regulate your metabolism and are critical to the body's ability to extract energy from food. They also keep your skin and nervous system healthy and help form red blood cells. Like many blue and purple fruits and vegetables, eggplants contain anthocyanins. These plant-based nutrients are antioxidants that help protect cells from damage by free radicals. Anthocyanins may also lower your risk of cancer and cardiovascular disease, suggest nutrition experts from the U.S. Army Center for Health Promotion and Preventive Medicine. Nasunins are one type of anthocyanins in purple eggplants. Nasunins slow angiogenisis, or blood vessel formation, which could inhibit tumor growth. Additionally, the chlorogenic acid in eggplant may help lower LDL cholesterol and protect the body from viruses. Eggplants can help you meet your daily requirements for vegetables, according to the U.S. Department of Agriculture, USDA. Of people who get less than 30 minutes of moderate exercise, such as gardening or long walks, not including daily activities, women ages 19 to 50 should eat 2 1/2 cups of vegetables daily, while men in this age group need 3 cups, according to the USDA. Choosing vegetables from different color groups helps ensure you get a variety of nutrients. Of vegetables in the blue/purple group, eggplant is one of the best sources of phenolics, which are also health-benefiting antioxidants, according to the U.S. Army of Center for Health Promotion and Preventative Medicine. To get the greatest benefits from eggplant, choose fresh, ripe specimens and prepare them in a healthy way. Ripe eggplants should have glossy bright purple skin and feel firm and heavy. Some species may be light purple or white, but brown streaks and wrinkled skin indicate an eggplant that's no longer fresh. Bake or boil your eggplants. Frying eggplant requires a large amount of cooking fat, which adds calories. If you do fry, use a vegetable oil like sunflower oil, rather than butter, advises Sam Montel, a nutritionist with the UK Food Standards Agency. Food Standards Agency: Ask Sam...: What Nutrients are Found in Aubergines?